An impressive anthology, a sequel to Memories and Visions, reviewed last issue, and like V. 1 mostly new fiction with a few reprints mixed in. At least four stories here are about as good as they can be: the brilliant Rachel Pollack's "The Girl Who Went to the Rich Neighborhood" (a fairy tale in a modern urban setting), J. L. Comeau's hard-edged, violent contemporary horror "Firebird", and two stories which draw on Polynesian and Native American mythology, Eleanor Arnason's "A Ceremony of Discontent" and Carol Severance's "Shark-Killer". Cathy Hinga Haustein's "Earth and Sky Woman" is also very good, but it's realistic, not fantastic, and apparently was included on the strength of being about a scientist. G. K. Sprinkle's "Road Runner", Deborah H. Fruin's "New Age Baby" and Ruth Shigezawa's "Hills of Blue, an Orange Moon" are all well-handled "small" stories, by which I mean they don't invest as much in their subplots or resonances as the best stories here. Good, flawed stories include "The Forbidden Words of Margaret A." by L. Timmel Duchamp (it posits a quarantine on an Angela Davis-analog; fortunately or not, the U.S. takes more subtle measures against most of its dissidents than do most of its puppet satellites, which Duchamp credits with inspiring this story; even as an allegory for the lack of access most U.S. citizens have to dissident views, the story comes off as heavy-handed); Elaine Bergstrom's "Net Songs" (yet another tyranny overthrown by one bold individual, but AIDS-angst well-channeled); Lucy Sussex's "My Lady Tongue" (which [seemed to me at the time] to be afraid to endorse lesbian separatism more out fear of offense than actual conviction); and Phyllis Ann Karr's "Night of the Short Knives", which strikes me as a minor Frostflower and Thorn story [Karr's sword & sorcery series]--likewise Ginger Simpson Curry's "Sahrel Short Swords" has several imaginative touches but is a too-familiar tale. Nonetheless, all of these repay the reader well; less satisfactory, if still readable, are Rosalind Warren's fannish joke "The Inkblot Test", Merrill Mushroom's "Mamugrandae--the Second Tale" (just as overly cute as the author's handle might suggest), and Cleo Kozol's "Picnic Days", which would've fit well into the back pages of the late 1950s Galaxy magazine as an example of heartfelt, playful, but ultimately bootless "comic inferno" satire. This book is definitely worth owning; the best work sings, and the least hums along well enough. 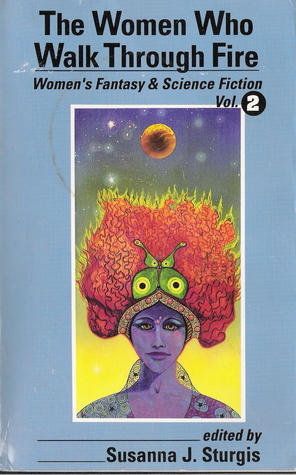 The Women Who Walk Through Fire: Women’s Fantasy & Science Fiction Vol. 2 ed. Susanna J. Sturgis (The Crossing Press 0-89594-419-7, Sep ’90 [Oct ’90], $9.95, 275pp, tp, cover by Beth Avery) Anthology of 16 sf and fantasy stories by women, ten original, with an introduction by the editor. A hardcover edition (-420-0) was announced, but not seen. THE WOMEN WHO WALK THROUGH FIRE is a early precursor to THE FUTURE IS FEMALE!, the newly published LIBRARY OF AMERICA volume. Recognizing women in SF...it's about time! Susanna J. Sturgis: The hardcover edition was mainly for libraries -- they put the paperback covers on a library binding. Thanks for the notice! Todd Mason: Thanks for the book! It was probably my favorite of the three Crossing Press volumes you did. Susanna J. Sturgis: Mine too, truth to tell. It's the most consistent, and in the years since I've remained in touch with more of the contributors than for either of the other two.